On the U.S. side, outrage continues over alleged ongoing Russian meddling in U.S. elections and domestic politics. 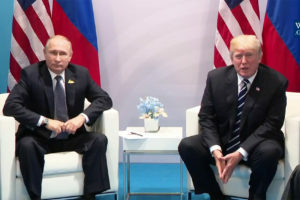 Although some sources have indicated that Russian influence operations slowed before the recent 2018 midterm elections, the investigation of Kremlin interference in the 2016 vote, led by Special Counsel Robert Mueller, is still underway, and with that shadow looming over the White House, high-profile conciliatory steps are unlikely. If Trump were to fire Mueller, or if Mueller were to release new, damaging information, congressional Democrats might even push for impeachment-although, having won only a modest victory in taking back the House, they will likely be careful not to overplay their hand. The Trump administration itself has regularly expanded and updated Russia sanctions, and this is likely to continue regardless of the president’s stated desire to get along with Moscow. On the Russian side, Putin is much less constrained by his own government, but he does face growing public dissatisfaction, even from his traditional political base. Earlier this year, Putin endorsed an unpopular pension reform scheme that will force Russians to work an extra five years before retirement, eroding his support among older voters and blue-collar workers, especially in Russia’s provincial one-industry towns, distant from the prosperous bubbles of Moscow and St. Petersburg. Public disaffection was further fanned by botched regional elections in September, which saw some of the Kremlin’s chosen candidates defeated outright or caught red-handed engaging in electoral fraud. For Putin, a high profile summit meeting with the U.S. president projects an image of strength and relevance to his domestic audience, one that state television will amplify. But it is not likely to be an opportunity for conciliatory diplomacy-Washington appears far more valuable to the Kremlin as an implacable external enemy and a scapegoat for Russia’s economic woes than as a partner demanding concessions.